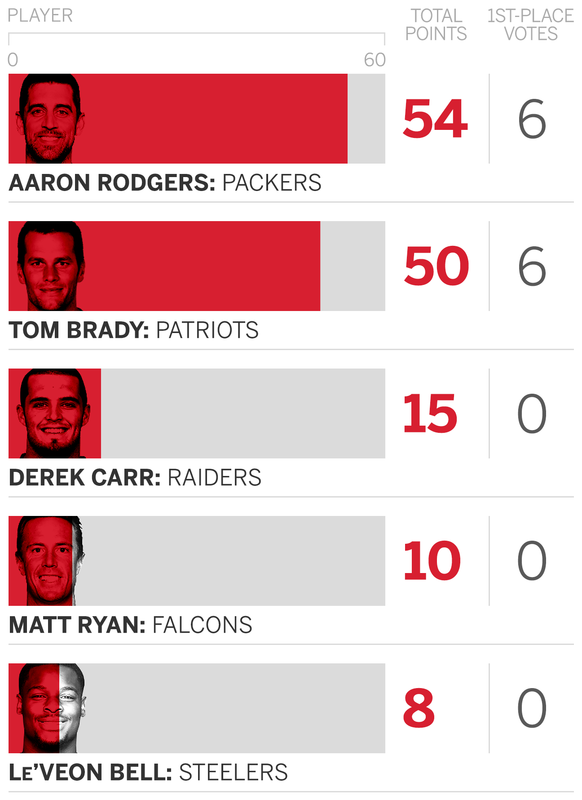 Oh yes, it's that time again -- time to poll our panel of experts on who they think will win the NFL's MVP award. We did it a lot late last year, and you all either liked or hated it so much that we've decided to bring it back. And we're rolling out our first edition before anyone has even played a game! It was an awfully close contest. In fact, our top two players got the same number of first-place votes -- six each from our panel of 12. You'll recognize the names of our top five picks, surely. And surely some of you will think we're fools. But know that it's a long year with a lot of twists and turns and that almost anyone can win this award -- as long as he's a quarterback. Methodology: We tabbed our 12 experts to nominate their top five candidates. First-place votes are worth five points, second-place votes worth four, third-place votes worth three, fourth-place votes worth two and fifth-place votes worth one. Remember when "What's wrong with Aaron Rodgers and the Packers' offense?" was a thing for the first couple of months of last season? Well, The Dude finished with 40 touchdown passes and just seven interceptions, while throwing for 4,428 yards and completing 65.7 percent of his passes before wiping out the entire NFC East in the playoffs. There are few players more capable of eye-popping heroics on the football field than this guy is -- even if we know he doesn't want that to define him. MVPs come from winning teams, and the Packers are the only team besides the Patriots that has reached the playoffs the past eight years in a row. So, you can safely expect Rodgers to be in strong contention for this award -- unless he gets hurt or heads off somewhere far away to search for inner peace. I say neither of the latter happens. Big year coming for Mr. Mustache. This is the guy so many of you thought got robbed last year, and I hear ya. Brady threw for 28 touchdowns and just two interceptions, racking up 3,554 yards in just 12 games. Extrapolate that to a full season and you get 37 touchdowns, three interceptions and 4,739 yards. That would have been Brady's third-best touchdown season, best interception season and fifth-best yardage season. The guy is an animal. His team is a juggernaut. You want to tell me you're worried because he's 40 years old and we haven't seen a quarterback perform at his level at that age? Well, until last season, we hadn't seen anyone do it at 39, either. I'll wait and see Brady fade out before I bet on it. Mr. Fourth Quarter. The guy whose Week 16 broken leg deprived the Raiders of finding out whether they were the team who had the best chance to unseat Tom Terrific & Co. But Carr is back, with a healed-up ankle and a beefed-up bank account. They added Jared Cook to his receiving corps and Marshawn Lynch to his backfield. The offensive line is still good. Amari Cooper and Michael Crabtree are still there. The defense looks as if it could give up some points, necessitating even more fourth-quarter comebacks. Everything is in place for Carr to launch himself into the MVP conversation in his fourth season -- especially when you consider he already was in the mix during his third. No love for the reigning MVP? Well, no one has won this award in back-to-back seasons since Peyton Manning in 2008 and 2009. And Ryan did lose his offensive coordinator, Kyle Shanahan, who's now the head coach of the San Francisco 49ers. That could have an impact. And everyone's still wondering what effects the Falcons as a team will feel from their brutal Super Bowl collapse. But apart from those things, there's no reason to think Matthew Ice can't deliver another big year chucking it to Julio Jones and Mohamed Sanu and dumping it down to Devonta Freeman. His line is still good too. And it's possible that last season wasn't a blip as much as it was a fully turned corner. The last time a non-quarterback won this award was in 2012, when Adrian Peterson came within a first down of setting the league's single-season rushing yardage record. Before that, the previous non-quarterback to win it was LaDainian Tomlinson in 2006. It's a quarterback award, but if anyone who's not a quarterback can win it, it's Bell -- a do-everything running back who's a candidate to collect 2,000 all-purpose yards, if he can stay on the field for all 16 games. He has done that only once in his four-year career, but he's already off to a good start; this is only the second time in his career that he'll be on the field for the Steelers' Week 1 game.